Caledonian Sleeper overnight train services connect London to destinations in Scotland. Whether you’re heading to the Highlands, Edinburgh, Glasgow or London, you’ll arrive refreshed to start your day. SAVE time on your travels in 2019, and with no hotel bills, SAVE money too. Get the latest Caledonian Sleeper cheap tickets, promotion offers, and discount code deals. We’ll keep you up to date with the latest Caledonian Sleeper discount code offers, and cheap tickets deals. Caledonian Sleeper tickets are available on all routes covering travel and sleeper accomodation or reclining seats. For the lowest price fares, book as early as possible. Tickets are available 12 months in advance. Travelling between Mondays and Thursdays is cheaper than Fridays or Sundays. Travelling in autumn and winter costs less than summer and holiday times. Get 1/3 OFF all Caledonian Sleeper tickets with a Railcard. In most cases, one trip will pay for the Railcard. Check out our updated Railcard discount codes and save on the card itself! What happened to Bargain Berths? Unfortunately, you can’t get Scotrail Bargain Berths anymore. The days of travelling by sleeper from £19 (did anyone actually travel on that fare?!) or more likely £39-£49 are long gone. The Train Hacker will have all the cheapest ticket deals. Check with us for the latest Caledonian Sleeper discount codes, promotion and offers. Book as early as possible for the best prices, accommodation and discounts. Fixed Advance and Flexible tickets are available 12 months in advance from £40. Caledonian Sleeper Fixed Advance are the cheapest tickets but have no flexibility on travel dates. Caledonian Sleeper Fixed Advance cost more but have flexibility on travel dates. Special offers and discounted travel for families. Caledonian Sleeper Family tickets offer more space and privacy. When travelling as an odd number, the spare bed is FREE. For example, a group of three can use two adjoining twin berths with four beds. Families also get access to First Class lounges at stations and the onboard lounge car. Children aged up to four years old travel FREE in sleeper berths and seats. Children aged 5 to 15 get 50% OFF adult prices. Children under 12 get FREE evening meals and breakfast with one adult meal. Also, complimentary fruit is available for kids. Flexipass carnet tickets offer discounts on 10 First Class journeys. SAVE £90 per trip compared to buying individual tickets. Groups of nine people and more should contact Caledonian Sleeper for discounts. Secure bicycle carriage is FREE; space is limited so book in advance. Pets can travel in berths subject to a cleaning charge. Rail pass and National Rail ticket holders can buy Berth Supplement tickets. Berth supplements are cheaper and cover the cost of sleeper accommodation only. Berth supplements are available for BritRail, Interrail Global and Great Britain and All Line Rover rail pass holders. BritRail England pass holders can only travel between London and Carlisle. All rail passes must be valid on the Caledonian Sleeper day of arrival. National Rail Anytime, Off-Peak and Super Off-peak ticket holders can buy Berth Supplements. National Rail tickets must be marked ‘any route permitted’ and cover the whole journey. If you choose self-print, either print your ticket or show your email receipt from a smartphone or other device. If you are buying tickets from overseas you must select self-print or collect from self-service machines. Tickets can only be delivered by post to UK addresses. The Caledonian Sleeper do not publish prices on their website; however, these are lowest prices I could find from dozens of searches! The prices below are for adults travelling on Lowland and Highland routes. Children aged 5 to 15 pay 50% of the adult price and under 5s are FREE. These prices do not include any Railcard or other discounts. Note: The Caledonian Sleeper website is showing different accommodation and prices for all routes from now to 31 May 2019, compared to 2 June onwards. So, it appears the new sleeper carriages start from 2 June 2019! BritRail, Interrail and All Line Rover rail pass and National Rail ticket holders can buy Berth Supplement tickets. You must hold the correct class of ticket or rail pass e.g. Club Solo berth supplements are only for first class ticket or rail pass holders. The Train Hacker will have all the latest Caledonian Sleeper discount code offers and cheap ticket promotions. The Caledonian Sleeper has two main routes to/from London: Lowland and Highland. Lowland services terminate at Edinburgh and Glasgow. Highland services terminate at Aberdeen, Fort William and Inverness. Travelling northbound, the Lowland route train leaves London Euston and stops at Watford Junction and Carlisle. Across the border in Carstairs, the train splits into two. One train goes to Glasgow via Motherwell, and the other Edinburgh. Travelling southbound, two trains leave from Glasgow and Edinburgh. Before crossing the border, the train joins. It continues on stopping at Carlisle and Watford, before reaching London Euston. For all stops, see the London to/from Edinburgh and London to/from Glasgow timetables. The Highland routes run between London and Aberdeen, Fort William and Inverness. The northbound train splits into three to serve each destination. Heading southbound, three trains leave Scotland before joining and continuing to London Euston. London to/from Aberdeen overnight train stops includes Watford Junction, Crewe, Preston, Kirkcaldy, Leuchars (for St Andrews), Dundee and Carnoustie. For all stops, see the London to/from Aberdeen timetable. London to/from Fort William overnight train (known as the ‘Deerstalker’) stops include Watford Junction, Crewe, Preston, Glasgow Queen Street and Dumbarton. For all stops, see the London to/from Fort William timetable. London to/from Inverness overnight train stops includes Watford Junction, Crewe, Preston, Falkirk, Stirling, Gleneagles and Aviemore. For all stops, see the London to/from Inverness timetable. Caledonian Sleeper timetables for Lowland routes from London to Edinburgh and Glasgow, and Highland routes from London to Aberdeen, Fort William and Inverness. All trains run six nights a week, excluding Saturdays. Overnight sleeper train timetables between London Euston and Edinburgh Waverley. Timetables valid from 9 December to 18 May 2019. Overnight sleeper train timetables between London Euston and Glasgow Central. Overnight sleeper train timetables between London Euston and Aberdeen. Overnight sleeper train timetables between London Euston and Fort William. Overnight sleeper train timetables between London Euston and Inverness. Timetables valid from 8 December to 18 May 2019. There are two kinds of accommodation: sleeper rooms and reclining seats. Take a virtual tour of first, standard and accessible sleepers and reclining seats. First and standard class sleeper rooms are well-equipped for a good nights sleep. The Caledonian Sleeper has recently changed their sleeper accommodation options, in advance of new sleeper compartments arriving in spring 2019. First class passengers enjoy single berth air-conditioned rooms. 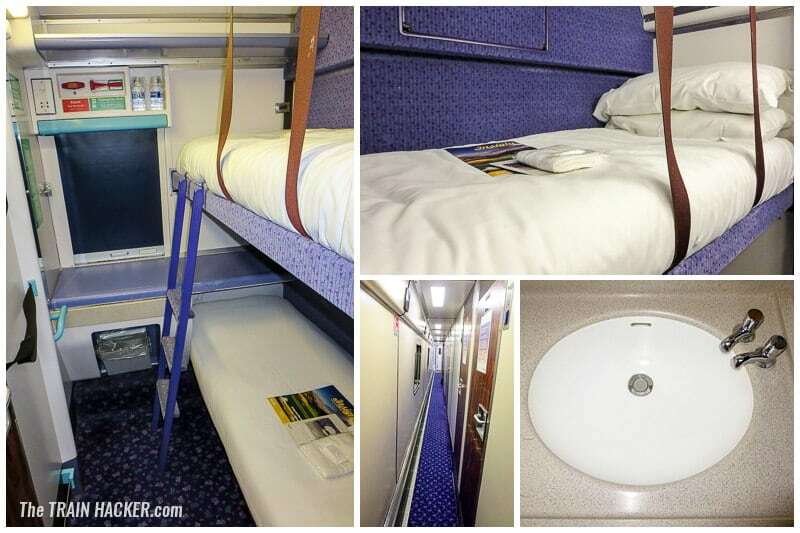 With more space and privacy, they’re the most comfortable way to travel the Caledonian Sleeper. If you’re travelling in a small group, you can reserve two adjacent sleeper compartments. Of course, small groups of adults can choose to move somewhere else! On every Caledonian Sleeper train, there’s a wheelchair accessible sleeping compartment and toilet. The accessible sleeper room can sleep one or two people. Contact Caledonian Sleeper to book and get help with boarding. Male and female toilets are at the end of one corridor in each sleeping car. There are no showers on board the Caledonian Sleeper. But there are shower facilities at all final destinations on route. Standard and seated passengers can buy £5 shower tokens on board from a steward. Relax and unwind in the lounge car and enjoy the best of Scottish food, drink and scenery. First class passengers and families get priority access to the lounge car. If it’s not busy, standard class passengers can use it too. The lounge car has a restaurant with tables and chairs and an area with leather sofas. After your evening meal, you can sit back and meet other travellers. The lounge car’s large, wide windows make it an ideal place to admire the views and enjoy the journey. Known as ‘The Deerstalker’, London to Fort William is one of the world’s most scenic rail journeys. Between Glasgow and Fort William, you’ll enjoy breathtaking views of the Scottish Highlands. The Caledonian Sleeper menus food and drinks are mainly sourced from Scotland. Families enjoy FREE meals for children under 12 with paying adults. Evening meals can be pre-booked online when buying tickets. Main meals include traditional Scottish favourites like smoked salmon salad and haggis. As well as British, there’s also Asian and European style food. To follow, choose from delicious traditional Scottish deserts or cheeseboard. There’s also sandwiches, fruit, savoury and sweet snacks. The drinks menu includes an impressive selection of Scottish malt whiskies and wines. Spirits, blended whiskies, beers and cider are also on offer. Non-alcoholic include fizzy drinks, fruit juices, mineral water, teas and coffee. First class passengers enjoy a complimentary breakfast in the lounge car or room. Standard class passengers get a hot drink and snack and can also buy breakfasts. Breakfasts include a hearty Highland, smoked salmon, bacon rolls, porridge and yoghurt. Seated car passengers can choose from a smaller selection of main meals, desserts, breakfasts, snacks and drinks. Arrive refreshed in the morning on the overnight train from London to Scotland. SAVE money on your journey with Caledonian Sleeper discount codes and offers. Find out information about Britain’s other overnight service, the London to Cornwall Night Riviera Sleeper train.